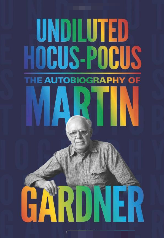 I was delighted to see Martin Gardner’s autobiography, as he was a great science writer. I loved his mathematical columns (mostly encountered through collections like Mathematical Puzzles and Diversions) and his annotated versions of books by Lewis Carroll – and he wrote well on the matter of pseudoscience. I ought to say straight away that the book was a bit of a disappointment. In part this is simply because Gardner had a very ordinary sort of life. I don’t say that disparagingly – it’s just like most of us. When you read a book about someone like Richard Feynman you have both the opportunity to read about his amazing work, and his remarkable life. Gardner’s work is its own tribute, while the life of a science writer is not all that exciting, certainly in this case. The other problem I had is that a lot of what’s in the book doesn’t particularly resonate. There are long sections about subtle debates in obscure (and now mostly forgotten) versions of 20th century philosophy, plus the politics of the University of Chicago that is hard to get excited by. And there is also Gardner’s sense of humour, which seems to be very much of a different age. Whenever he recounts a ‘funny’ story, it’s a bit like looking at an old Punch cartoon – you can’t quite understand why it was considered humorous. This comes through strongly when Gardner spends several pages recounting the ‘hilarious’ exploits of a practical joker friend. At one point we are told there are many examples of this practical joker at work, but Gardner is just picking out two, presumably the best. One of these involves writing to a paperclip manufacturer, complaining that the box of 100 clips only has 98 in it, and when he opened the box, it smelled funny. The punchline is that the manufacturer wrote back to say that numbers in the box varied, so it could be a couple under or over 100, and they didn’t know why it smelled funny. My, how we roared with laughter. Attempts at humour aside, the book comes alive when Gardner talks about mathematical puzzles, magic and testing fraudulent pseudoscience – but it is a relatively small part of the content. Also of real interest is his honest explanation of why he was a deist, though no longer a Christian, and the entertainment he clearly got from winding up atheists who expected him to be one of them with his arguably irrational but very human arguments. If, like me, you are are a Gardner fan, you will find material to interest you in here – but don’t expect it be a rip-roaring page turner of an autobiography. It is a gentle meander through a mostly unremarkable life story that produced some decidedly remarkable writing.